We're all looking forward to warmer weather this summer, but we're not looking forward to uninvited guests—namely pesky hornets and wasps. The Aspectek Trap is our favorite wasp and hornet trap out of the five we reviewed because it doesn't stray from the basic premise of what a trap should be: affordable, effective, and easy to use. It features a pear-shape model specially designed to trick wasps and hornets when they fly into entry holes after smelling an attractant liquid. The attractant mimics the scent of the nectar they would normally drink in their natural environment, so they're instantly drawn in as soon as the aroma hits their senses. The points of entry are formed like funnels to shoo the insects inside of the trap, but they are too small to act as points of exit. The hornets and wasps are then stuck inside the trap, where they either get caught and drown in the attractant liquid, or simply starve to death within a few days. The Aspectek Trap for Bees, Wasps, Hornets and Yellowjackets come in a 2-pack and are reusable, so they can be used and reused throughout the yard season after season. We've got lots of extra information about wasps, hornets, and why they infest your yard, as well as four other product reviews comparable to this one. If you're curious, keep reading below! Want to skip all this research and just hire a decent exterminator for your wasp and hornet problem? Wondering What to Put in a Wasp Trap? Curious Where to Hang Wasp Traps? How Should Reusable Traps Be Cleaned? We will review different types of both of these kinds of traps, as they each have their merits. Every trap that uses a barrel or a receptacle to catch the wasps or hornets will also use a lure or attractant. This is a sweet-smelling liquid that will appeal to the pest's senses from afar and drive them toward the trap, bringing them inside. Though commonly referred to as just "attractant," this liquid can sometimes be called "bait" as well. Because wasps drink nectar in the wild, they're attracted to sweets whenever and wherever they can find them. This means that your kids' fruit punch, your sodas, and the fresh fruit you enjoy on the patio this summer could drive the wasps and hornet straight to your backyard get-together. Read Also: What's the best spray for wasps and hornets? Keep this bit of information in mind when you're formulating your own wasp attractant! If you're cooking up a recipe to bring the hornets and wasps directly to a trap you're setting out, be sure to blend a mixture of water with ample sugars that the pests can smell a mile away. This will mimc the nectar they crave naturally. Is Vinegar a Wasp REPELLENT or a Wasp BAIT? Vinegar is actually a prime bait for German yellow jackets, according to findings from the University of Wisconsin-Madison. The report confirmed that vinegar, in combination with a fermented form of molasses, is one of the strongest known attractants for this type of yellow jackets (a cousin of wasps and hornets). So, if you're wondering whether vinegar will repel or attract these pests, wonder no more. If you're looking out across you're yard, you may be asking yourself where the best place is to hang the traps to catch the most wasps or hornets. First things first: go where there's food. If you have outdoor trash bins that only get collected once a week, invest in some traps to hang next to the garbage area. Wasps and hornets will swarm around the garbage cans for food (especially once the temperatures rise in the summer months), so this is a great spot to take out a large number of pests. Also, make sure to target areas with standing water. If you have a pond or a pool, hang a few traps around the perimeter of the water. These insects are drawn to water, so you want to draw them to the trap instead of your water source. Lastly, make sure that you place the trap 20 to 30 feet away from where you and your family members normally spend time. This will draw the pests away from the area of activity and keep a pest-free zone while trapping the wasps and hornets simultaneously. Indoor Wasp Traps...Do They Exist? Typically, wasp traps are marketed and sold for outdoor use only, but you can make a trap yourself with a few supplies. Place these traps around your home and empty them frequently. This brings us to the next topic...how should you empty out a reusable trap? We've included a few types of traps which can be used several times over, which is awesome from a sustainability standpoint. But how does one go about emptying and cleaning these traps (especially with dangerous stinging pests involved)?? The process is actually really straightforward: the lid simply screws off, the trap comes apart, and you can clean it out without a problem. Just as easily as you put in the attractant liquid, you can hose the trap out with some detergent and water, and it will be as good as new. Be sure to place your clean traps outside in the early months of spring, as this is when the queens wake up from hibernation and find a suitable place to build a nest. Even if you think it's too early to hang your traps, it can't hurt to be prepared! Read Also: What's the best repellent for wasps and hornets? Want to skip all this research and just hire a decent exterminator for your wasp problem? Aspectek has designed a simple, seamless trap for everyday use and upkeep in a yard or garden, and we've set it as our top contender for its simplicity. This trap combines functionality with utility, luring the hornets and wasps to the sweet smell of the sugar attractant inside the trap, while the pear-wall design creates a barrier that confuses the insect, making it impossible to fly out. Once a wasp or hornet flies into the entryway chamber, it's unlikely that the pest will ever make its way out. We recommend this product because it's inexpensive, it's effective, it's reusable, and it delivers on its promise to trap wasps and hornets. This trap takes an insect's natural attraction to light into consideration and uses it to the advantage of the consumer. 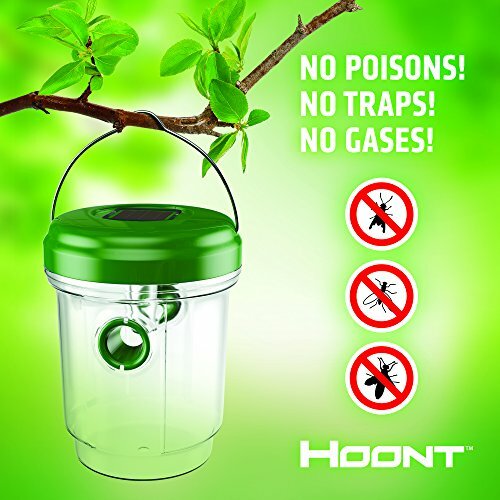 By placing a solar-powered, UV light inside the standard design of a wasp and hornet trap, Hoont has upped the ante as far as traditional traps go. They've added an extra lure, which means that the trap you set will be extra attractive for any wasps or hornets that may be buzzing around your yard. Because the light up top is solar-powered, you don't have to worry about outlets or batteries. Simply place it where the sun can charge the solar panel during the day, and it will click on automatically at dusk. That trap itself works in the usual style: the wasps and hornets will be attracted to either the light inside or the sugary attractant solution in the bottom of the container, and they'll fly in through the small entry holes. Once inside, the entry holes will be too small to fly out again, locking the insects in the trap, where they will die after a few days. 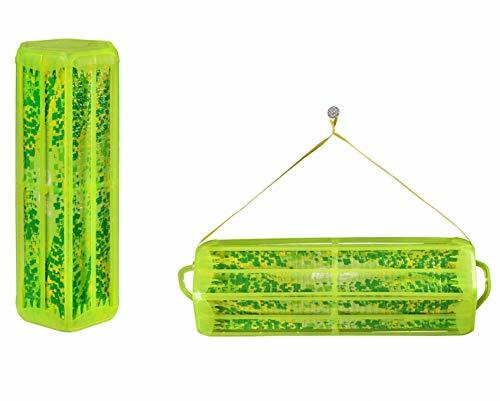 These hanging traps work by luring wasps and hornets with their bright colors, then use an adhesive agent on all sides to make sure they stick around...literally. We recommend these for use on decks or highly wooded areas around pools, as they target wasps that love stagnant water. If you've got a pond or a pool, this is the product for you. This comes with a plastic guard rail on both sides so that hummingbirds don't get stuck on the trap as well, and works to target the queen wasp or hornet in order to eliminate the entire colony. We recommend Rescue! 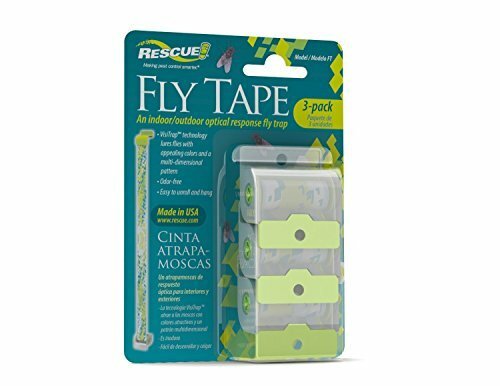 Visilure Fly Tape to catch hornets and wasps for the simple reason that it's cost-effective, and advantageous if nothing else on the list can work for your home. What we love about the Visilure Fly Tape is that it can be applied to virtually any surface, anywhere—setting it apart from pretty much every other trap on the list. While the other wasp and hornet traps rely on nylon strings to hang, Rescue! has created this product with versatility in mind: you'll be able to stick this adhesive tape anywhere you need in order to lure wasps and hornets to trap them. 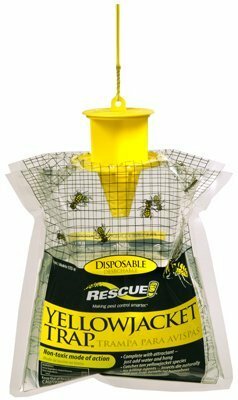 This is a standard, straightforward type of hanging hornet trap that consumers have come to expect from Rescue!, a top-quality name brand. The way these traps work is similar to the other hanging traps we looked at in this list: a sweet-smelling attractant is placed in the plastic receptacle bag, and the wasp or hornet flies in through a small hole in the top of the trap. dead insects—simply set the traps out and toss them in the trash when they're full of dead bugs. Wasps and hornets aren't pleasant, but you don't have to live with them in your yard, and you definitely don't have to let them take over this summer. When we looked at all the different types of traps for wasps and hornets, we kept coming back to the Aspectek traps. Why? 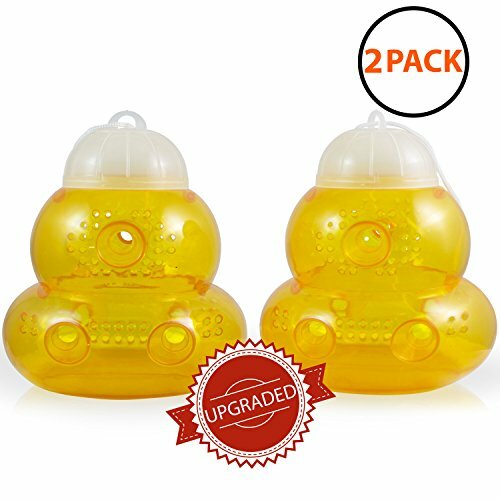 These traps are affordable, meaning you can buy a few to set around your yard and totally eliminate your wasp or hornet problem. Curious about other wasp and hornet related products? Check out our other detailed guides to help you deal with your pest problems. Scented Fly Ribbons hung close to wasp traps we found effective also in catching yellow jackets. Good to know, thanks Earle! We’ll look into adding that into our article.